Amakusa and Itsuwa come to Academy City to protect Touma from Acqua. #07 - "The Third Level"
Whenever this show makes a point to name an episode after a seemingly trivial detail, you know it's obviously not a trivial detail. Something I had not known about Academy City was how much of it was actually underground. Well, I do now, and the power stations for a particular school district is on top of their underground facility. This will be important later in the arc, I'm sure. The episode title refers to what happens on this certain school district's 3rd level, where a conveniently placed spa gives the audience the very necessary fanservice to go with the slice of life offering before the violence and suspense starts up. 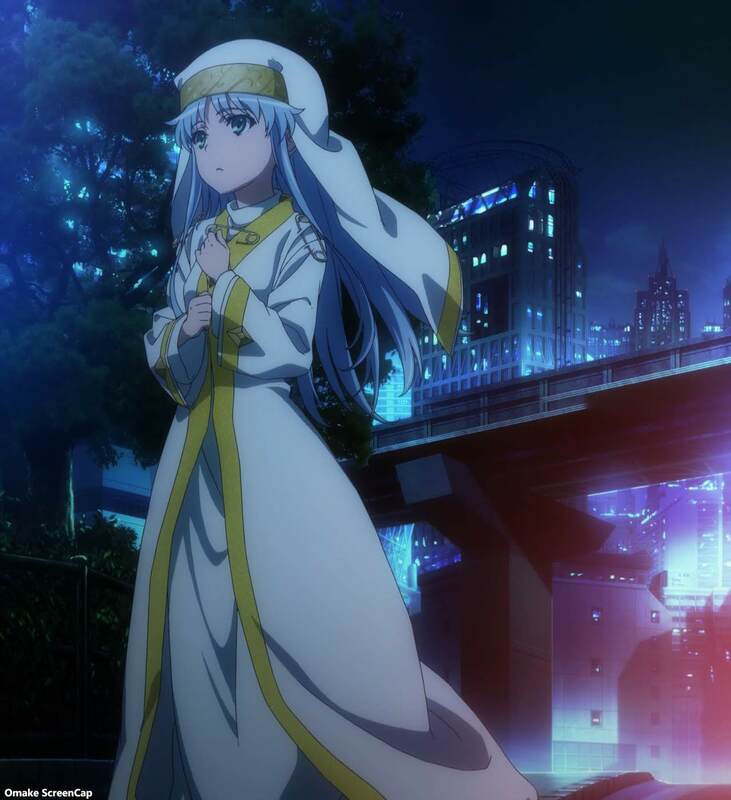 Interesting things to note as Touma somehow defeats this Acqua guy - he has Saint powers to go along with his Angelic powers that the Right Seat of God guys have developed. I'll have to be careful that I don't keep writing Right Hand of God, which in biblical terms means the same thing, but is way too obvious in referring to Touma's Imagine Breaker. Acqua pulls things and moves around from shadows and he really wants Touma's right arm. Touma is understandably reluctant to part with that. Slice of life start! Big trouble! Touma's class is late to lunch and they have to sneak out to a convenience store to get food. So, Touma has already met Acqua, after he dispatched Vento. That's two guys of this Right Seat of God that he's already beaten. I don't think Acqua is going to underestimate him and play around like the other guys. Ha. Now Touma is underestimating their interest in him. He's just a high school kid... that's stopped their big plans twice already. Ooh. Itsuwa is going to be his bodyguard and live with him. Flirty business starts now. Har. The rest of Amakusa is trying to get them together. And here comes Mikoto. Touma's harem is going to all get together at some point during this arc. Ha. Mikoto says "hey!" like Last Order does. 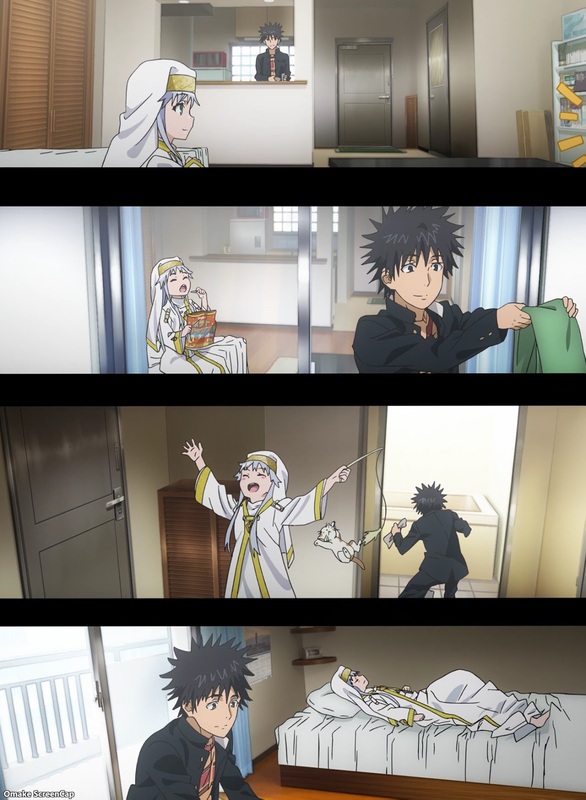 Index isn't mad Touma brought a girl home. She's mad Touma didn't bring food home. And she bit him anyway, after being placated by food. I didn't get a "misfortune!" out of Touma, though. Even Tsuchimikado's little sister the rolling maid has to invade. This is all too much slice of life going on here. Tsuchimikado has his own loli problems. Of course Index has to break the tub. Bathhouse hijinks! Itsuwa can drive a motorcycle. Hot. Really? We're already bringing the whole harem together at a bathhouse? Mikoto has a long way to go to get that free froggy strap. She's not going to get Kuroko's help either. Mikoto overheated. Is that a thing for her? The music changed. Stuff is about to go down between Acqua and Amakusa. Ouch. Itsuwa can't use magic to heal Touma because of his right hand. Touma has a day to cut off his right arm and give it to Acqua. Like that's going to happen. New ending sequence, with Index probably on the Third Level of School District 22. Next time, Spiky-kun gets serious?